UMX Product Display Reels, Retractors or Retriever With Adhesive Tape For Easy Installation. The RT-61 product display reels, retractors or retrievers come with adhesive tapes on the back of retractable reels. They are specially designed for displaying, retrieving, or easy accessing small items, like cosmetics, lipsticks, perfume bottles, pricing tags, manuals, instruction guides, keys, pens or accessories etc. Adhesive tape already pre-installed on the back of display reels, just peel off the paper backing and stick, the reels can firmly stick onto any display area. A large selection of hardware attachments, connectors, clips, hooks, snaps, binder rings, cell phone style of strings and parts are available for your custom retractable display reels. A photo quality custom imprinting for your company's and product's trademark or logo are also available. If you have any special needs, just inquire at UMX, we will create a custom display reel unit for you! 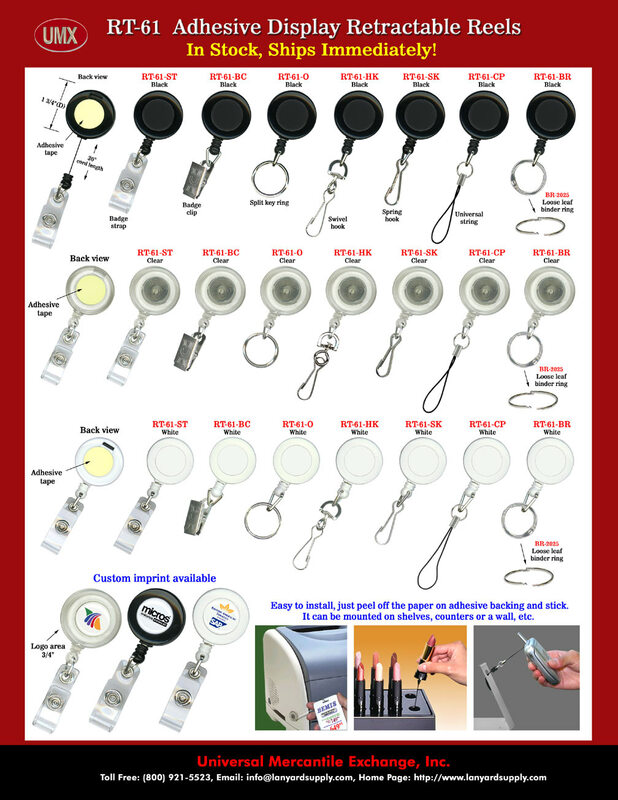 Your are viewing Lanyards > Badge Reels > High Quality and Low Cost Retractable Display Reel, Retractor or Retriever For Displaying Small Items.